EDGE can import raw .CSV or .XLE Solinst Levelogger and Barologger files into EQuIS Live tables. Water Level Elevation compensation may be performed for barometric pressure based on data from these devices. EQuIS Live is required for this logger. 1.Live data sections must be enabled in the EDGE format; this is detailed in the Turn On/Off Live Sections in EDGE Format article. 2.SYS_LOC_CODES used in the logger must already exist in DT_LOCATION. 3.Date formats must be 24-hours. The field character length does not support AM and PM values. There are two options for importing data. The first can be accomplished without calibration/calculation, and is explained in the article on Live Logger Import. The second option is with calibration/calculation and is explained below. EDGE and Professional can be configured to calculate water elevation data from the raw Barologger and GoldLevel logger data. The calculation formula is illustrated below. 1.Ensure the Live data tables have been enabled, as explained above. 2.Load the Barologger data to EDGE and import into the EQuIS database. Note: To allow the compensation to occur, there must be a Barologger reading that is fewer than three hours older than each Level logger record to be uploaded. 3.Create a record in DT_LOGGER for the GoldLevel logger. It is helpful to use DT_LOGGER.REMARK to note which record belongs to the GoldLevel logger and which belongs to the Barologger. 4.Set the DT_LOGGER.CUSTOM_FIELD_1 (for the GoldLevel logger) = DT_LOGGER.LOGGER_CODE of the Barologger record. 5.Set DT_LOGGER.SYS_LOC_CODE for the GoldLevel and Barologger. 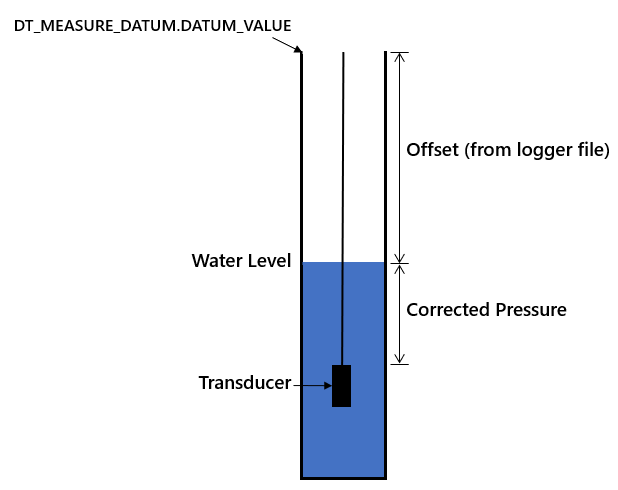 The image below provides an example from DT_LOGGER. 6.Create a record in DT_MEASURE_DATUM for the reference elevation for the SYS_LOC_CODE specified in Step 4. Be sure to set the START_DATE to a point in time before the earliest data logger data to be loaded. 7.Load the GoldLevel logger data to EDGE and Export to EDP. The image below provides an example of GoldLevel Logger data imported to EDGE. 8.Import the GoldLevel data into Professional EDP. 9.At the Create step, a new DT_LOGGER_SERIES record will be created for Elevation data. Check DT_LOGGER_DATUM to confirm that the Elevation data has been correctly calculated. 10.Commit the data to the database.